If you are passionate about cars and have kept your eyes open, while out on the streets, there are high chances that you had come across one of the new Volkswagen Beetle cars. The new Volkswagen Beetle is refreshingly different from its ancestor and has become a favorite to most of the Americans in the past 5 – 6 years. However, the credit goes to its manufacturer, which is actually a German company. Though it is rumored that Volkswagen Beetle was invented by Adolf Hitler, however, it is not exactly that way. Adolf Hitler did have his inputs in the implementation of this car; however, it is incorrect if the entire credit is given to him solely. With time, though many cars had changed their original design and have developed low fenders, sleek lines and super high powered engines; however, this does not hold true for the new Volkswagen Beetle. Decades have passed but the Beetle has not changed much, i.e. it has not become bigger in size than the original 1930s version, which is an all time favorite. It has maintained its small and compact size and the fuel efficiency as well as its rounded design has remained its integral part; all of which have remained more or less unchanged in the face of the evolutionary process that it had experienced. Volkswagen Beetle is a people’s favorite for various reasons; one of these being its visual appeal. It is reminiscent of the lifestyles of beautiful and confident ladies as well as well-to-do gentlemen; it reminds us of the warm summer days and over and above all these, being fuel efficient, it has become a darling in today’s world where the ever-increasing gas price and stagnating wages are taking their toll. The rounded lines and the headlights that resemble eyes are the most adorable and standout features of this classic Volkswagen Beetle. I am sure, you still remember Herbie – the anthropomorphic Volkswagen Beetle that featured in several Disney motion pictures starting with the 1968 classic, The Love Bug. Herbie played a very important part in making Beetle such a favorite and a part of the popular American culture. If, deep down, you have a burning desire to own a Volkswagen Beetle, you can explore a number of alternatives for this. You can acquire the recently released new Volkswagen Beetle or can even try out one of the older versions. These are great for restoration projects and can also be found restored; though, it is a bit time consuming process that can test your patience. It is true that Volkswagen is not an American- made car, but, like you and me, Americans do love it. These adorable little devils had caught people’s fancies and desires even before the World War II and by the way things are spanning out, it seems this love affair is here to stay. So hurry, scan your local newspaper or go online to check out the offers on numerous Volkswagen Beetles, restored and ready to be restored and get the one you like best. Look out for your Volkswagen Beetle, either new or old, and you might land up on an exciting offer. If you are thinking of start a DIY electric car project and you are looking for a donor vehicle, an old Volkswagen Beetle is actually a perfect candidate. This is because of its light weight, ample storage space for on board deep cycle batteries and rear wheel drive. 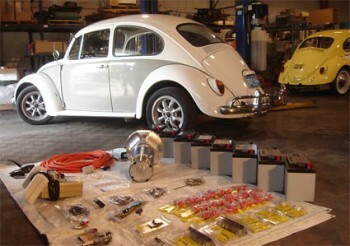 To start converting a conventional Beetle to run purely on electricity, check out the ConvertEV guide written by Les and Jane Oke.